The Coen brothers have always delighted in playing with the conventions of cinema. Their tale of small-town cops bamboozled by brutal homicide in the frozen north, Fargo (1996), was a unique twist on black crime comedy. The dusty, pedal steel songbook of O, Brother Where Art Thou? (2000) was a wry re-invention of the deep-south musical. Never have they taken aim at Hollywood as squarely as in this overtly affectionate paean to the golden age of the silver screen. 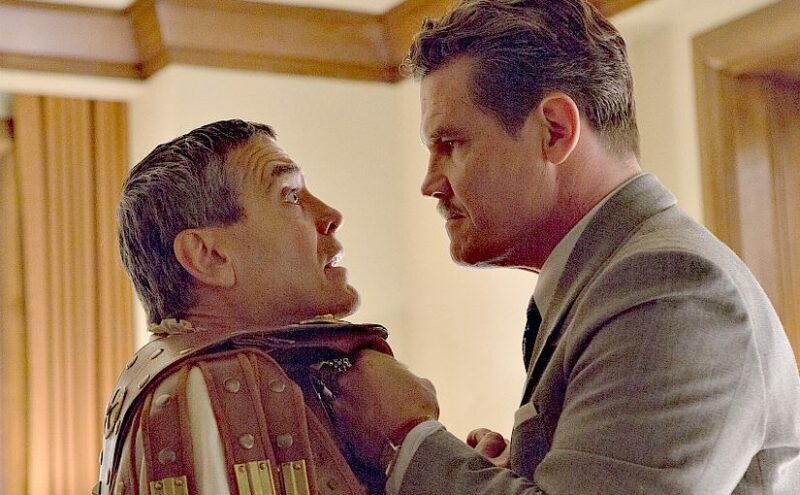 Eddie Mannix (Josh Brolin) is the stressed studio exec around which events whirl. As Head of Physical Production at Capitol Pictures, he endeavours to make the grandiose ambitions of his company chiefs a reality. He has to keep egotistical actors, self-important directors and gossip-hungry press all happy. In a fantastic early scene strong enough to work as a stand-alone sketch (in which the spirits of Woody Allen or Mel Brooks might be detected), he also has to ensure the community’s religious leaders are kept sweet. His hopeless task is to secure firm guidelines on depicting the Christ from firmly opposed faiths. Because the film in current production is Hail, Caesar!, a biblical epic of the scale and evangelism epitomising fifties Hollywood. A period of unmatched opulence on screen. The backdrop: an uptight, paranoid America deep in the throes of the Cold War. Mannix’s frantic role sees him struggle to balance his work with his home life. He visits confessional daily to expunge his guilt. His problems suddenly go from bad to much worse when Baird Whitlock (George Clooney), narcissistic screen idol and the picture’s leading foot soldier, inexplicably goes missing from the set. Meanwhile, gunslinging cowboy pin-up Hobie Doyle is being thrust into more demanding roles when studio bosses decide his career needs a makeover. Ralph Fiennes is Laurence Laurentz, the veteran British director saddled with this reluctant Yankee dumbfounded by the Queen’s English. Fiennes displays as fine a touch for comedy as he did in The Grand Budapest Hotel (2014). And Alden Ehrenreich’s Hobie is great fun, a character ridiculing shallow movie stars blessed with looks but unable to deliver a single line convincingly. Other appearances amount to little more than the briefest cameo. You might feel a little short-changed if you were looking forward to spending time in the company of Frances McDormand or Jonah Hill. Both are economically employed to say the least. Primarily, then, this is Brolin’s picture, with core comedic support coming from the captured and confused Clooney. Watching Hail, Caesar! gives a lovely, giddy sense of being on a carousel. Spinning round and round, we come to rest on each plot strand seemingly at random. Grand set pieces are naturally woven in. A synchronised swimming routine. A song and dance number. A rousing climactic speech. All glorious motifs of cinema’s vintage years. In these scenes we sit back and enjoy the spectacle, relish being entertained as if transported back to the era the Coens are exalting. The camera melts seamlessly into the films within the film. Occasionally we are ripped out of the facade, back into the ‘reality’ of the mechanics of production. So good so meta. But never in a forced or conspicuous manner. It’s always effortless, logical, and handsome. A resounding success, despite the multiple sub-plots, is that it’s the easiest of watches. Once the revolving action resolves, piecing the elements together with hindsight reveals that delightfully little of substance has actually happened. Yet somehow we have been hooked on every chaotic turn. Such is the absurd, self-important world Mannix inhabits. The gloriously grandiloquent, self-obsessed microcosm of movie mecca in its heyday. Hail, Caesar! might not be the most madcap caper compared to earlier Coen classics. But it is consistently entertaining, poignantly unhinged, and cheekily but honourably reverential of its subject. A multilayered love letter to the lunacy and lavishness of a lost Hollywood. What a pleasure to revisit it.